Why do we recommend you to choose us for this service? We offer this treatment because we tried it for our own body and the results were amazing and noticable. We tried this procedure for ourselves and Made sure that it really works then we start to offer this treatment. 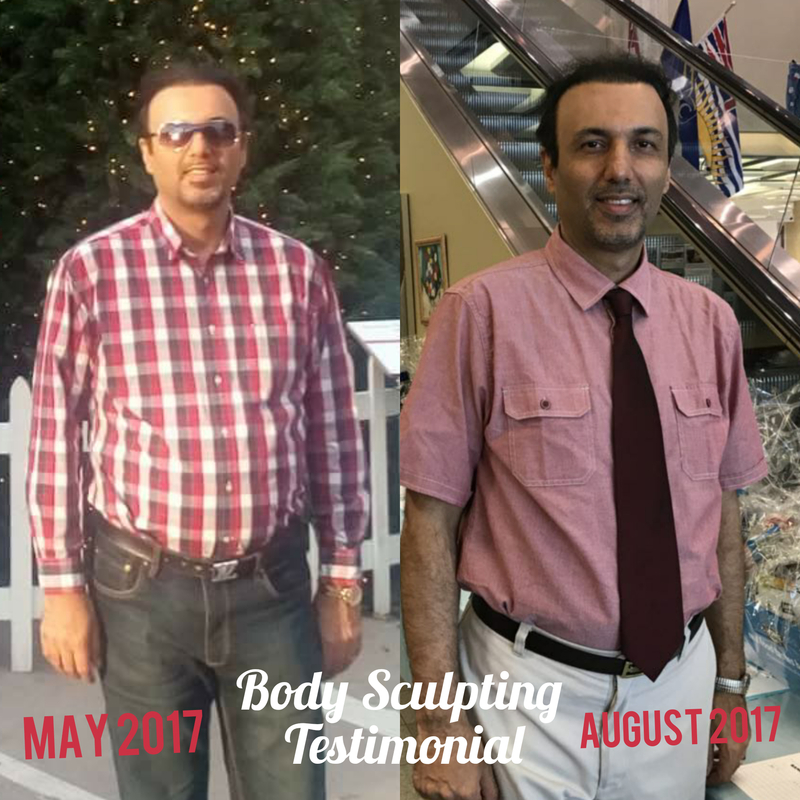 We really saw measurable decrease in size around the belly area and back.This issue is completely visible on above photo that is related to Dr Sharam .He lost 2.5 inches around belly after receiving two treatments with our machine. We Recommend to “TRY A SERVICE THAT PASSED THE TEST ALREADY”. We are sure about the effectiveness of our machine and You will not waste your time and money . On the other hand adjusting the settings of machine properly is an issue that directly increases success rate of treatment. Coulcontouring is a procedure that removes stubborn fat – up to 20% of fat cells per treatment. Coolcontouring is a permanent fat cell reduction treatment.It freezes fat away without damaging other tissues. During adolescence, the human body produced all of the fat cells we will get in our lifetime. Our bodies do not produce more fat cells as we age, unless we become obese and our fat cells divide. With a healthy diet and regular exercise the results of Coolcontouring can be visible for years to come. Individual results may vary, depending on fat density and size of the treated area. Most clients see results fairly quick. Ideal results often show up between 8 to 12 weeks after treatment. The treatment is comfortable and takes a maximum of 1 hour. The patients often read on their cellphone or listen to music during the procedure. The technique is permanent, non-surgical and without downtime. The fat cells that are damaged by the treatment are frozen and later on absorbed by the body’s own metabolic process. They thus are gone permanently. This advanced cooling technology selectively targets and eliminates fat cells gently and gradually, without affecting the surrounding tissue. Experience cold fat reduction and body slimming without bothering yourself. Coolcontouring® is a non-surgical procedure that uses a handheld device to precisely freeze and destroy fat below the surface of the skin. The treatment is not intended to create significant weight loss, but for treating unwanted, stubborn areas of fat, resistant to diet and exercise. When Can I see Ideal Results? Typical results take about 1-3 months to be fully visible, and therefore many patients schedule second treatments at that time. A second treatment is generally scheduled 30 to 45 days after the initial treatment. The results are long-lasting, as long as you maintain a stable healthy lifestyle. If you gain weight, the remaining fat cells can become larger in size. So as long as you don’t gain weight, the effect will last. If one maintains the same diet and exercise regime, Coolcontouring results shall be long lasting. Which Areas Can be Targeted For Treatment? It can be used safely for upper arms, inner/outer thighs, bra-strap area, chin, and above the knees. How Long Does The Coolcontouring Takes And How Many Treatments Are Needed? A typical session takes 50 minutes to one hour. We may increase or decrease the time based on the temperature that we adjust. Number of sessions one requires also depends upon the individual. What are your goals as far as circumference reduction? If there is significant work to be done, you can expect multiple sessions, however, if you have “just a little bit extra”, that can’t be shaken with a good diet and exercise routine, then one session is likely sufficient. Side effects are not visible in all cases.Mostly reddness and/or bruising in treatment area may happen that will be disappeared within couple of hours to days.A few customers experienced deep pulling, tugging, numbness or discomfort. Following the procedure, a typical side effect can include temporary numbness, redness, swelling, bruising, firmness, tingling and stinging.These side effects are temporary. Can I Get Two Treatments For Two Areas in One Session? In our clinic you can get treatments for 2 areas at the same time i.e., stomach and arms. COMMON TREATMENT AREAS INCLUDE: STOMACH, LOVE HANDLES, FRONT BRA FAT AREA, ARMS, THIGHS AND LOWER LEG. HOW LONG DO COOLCONTOURING RESULTS USUALLY LAST? As adults we do not produce new fat cells, so the number of cells destroyed and removed from the body, remains gone for a long time. With a healthy diet and regular exercise the results can be maintained for years. The treatment can be repeated after 2 months to remove more unwanted fat. For your Convenience We Do Any Service More Than 500$ Every Weekday – even Sundays. Please Call us For an Appointment.